Forget your favorite steak house, stay home, save money and make restaurant-quality food in the comfort of your own home with the De'Longhi Indoor Grill and Smokeless Broiler. Be your family's own professional chef with the only indoor grill with a professional broiler drawer. This unique feature lets you first sear the food on top of the grill, and then complete the cooking process in the broiler for perfect, tasty food every time. 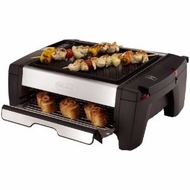 With a semi-embedded grill plate, it distributes heat evenly, so you will always have consistent results. If you've been grilling for hours, you won't be cleaning for hours, simply wipe off the non-stick grill plate, empty the convenient oil and grease drain cup and remove the broiler drip tray. It's that easy! With an extra-large surface and two-tier cooking capability, you can make a meal for your family or a party in no time at all. It's safety first with this indoor grill, the micro switch automatically shuts the unit off if the broiler is not in place. Other highlights include convenient on/off indicator light and cord storage. Don't wait for summer to satisfy your craving for delicious barbecued meals, enjoy them whenever you want with the Indoor Grill and Smokeless Broiler by De'Longhi. Restaurant-quality results in your own home with the professional broiler drawer. First sear the food on the grill plate, then complete the cooking process in the broiler drawer for delicious professional-quality results. Distributes heat evenly for the best results due to the semi-embedded grill plate heating element. Cook twice as much food in half the time with the two-tier cooking capability. Simply use the grill top and broiler at the same time. Perfectly grilled food to your preference with the adjustable thermostat. Easy-to-clean with non-stick grill plate, removable broiler drip tray and oil/grease drain cup. Simply wipe the grill plate, empty the cup and clean the drip tray.